"Safely trim 6 alpaca teeth in 3 seconds!!" "The Alpaca Breeder's Favorite Tool"
teeth in world record speeds!. 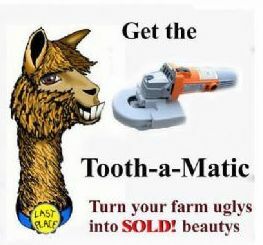 Over 1800 units sold all over the world, The Tooth a Matic has become the modern alpaca breeder's best friend since 2003. The Tooth a Matic requires only 1-Person to perform the trimming of teeth . I proudly proclaim this is the MOST EFFICENT tool our industry has ever known, saving an estimated 4,000 man hours per year around the world benefiting from the 3-4 second TAM trims vs. the 4-5 minute dental work when ob wire, dremels, and tranquilizers are used. Allow the Tooth-a-Matic to safely cut your alpacas teeth while YOU are protected from breathing in harmful tooth dust into your lungs. The Tooth a Matic encapsulates much of the dust in it's enclosed cavity, NOT in your lungs. 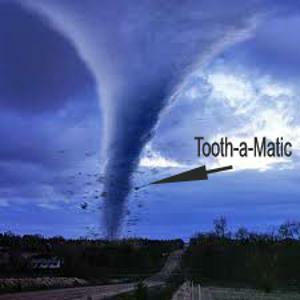 So, Just how TOUGH is the famous Tooth a Matic? "OH OH OH OH OH YOU ARE NEVER GOING TO BELIEVE IT!!! Found one of our ToothOMatics in a distant pasture recently from the tornadoes last April 27th. As you know, the barns are gone...AFTER almost a solid year, being taken over 20 acres away, submission to the weather since...cranked the stinker this morning for shearing with a friend (not to use, it looks pretty rough, but to "see")...although rusted beyond belief....IT WORKS!!! The Tooth O Matic took a SERIOUS lickin' but keeps on tickin!!! hahahahaha. Buy our females, and get a FREE Tooth a Matic!